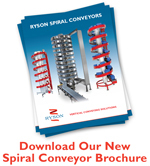 Ryson is the number one manufacturer of spiral conveyors in the USA. 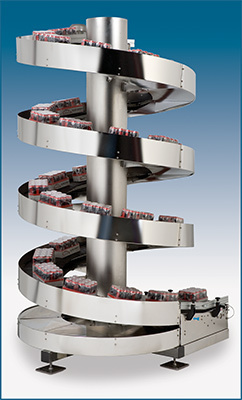 Ryson Spiral Conveyors are based on a new and innovative technology, offering many features and benefits. Ryson Spiral Conveyors need less floor space than conventional conveyors and are also faster and more reliable than any elevator or lift. Central to our design is the proprietary slat-type belts with rolling friction and without any sliding movements or wear-strips. An innovative modular design allows Ryson to customize with ease and be economically modified in the field to accommodate changing needs. All spiral conveyors are made to order and are available in 4 basic configurations ( A, B, C and D), accommodating most requirements relating to the location of the in and out feed tangents. All configurations can operate up or down in a clockwise or counterclockwise rotation and can optionally be reversible. 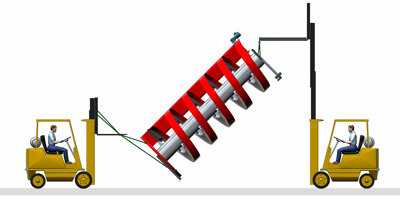 The position and length of the in feed tangent on up spirals and out feed tangent on down spirals can be customized to meet specific layout requirements. Samples are shown above (A-EX, B-MA and C-EX). This innovative belt enables a low rolling friction operation without any sliding movements or wear strips on the spiral conveyors. The belt is pulled by a heavy duty steel roller chain and the slats are supported by precision steel roller bearings which ride on a polyurethane surface. This arrangement effectively takes up the side forces created by a tight radius and at the same time increases the load carrying capacity of the belt up to 75 lbs per linear foot. 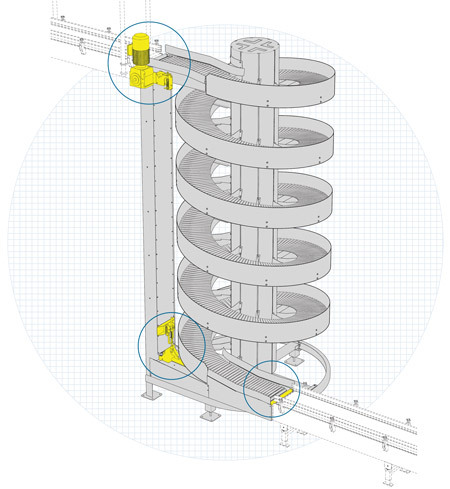 This enables the spiral conveyors to start and stop fully loaded and facilitates high speed, low noise and long life. Overlapping slats are used on the Unit Load and High Capacity Spiral Conveyors, providing an efficient and safe conveying surface for cartons, cases, trays, totes and all sorts of packaged products. Available in 8”, 12”, 16”, 20”, 24” , 26 and 30” wide slats. 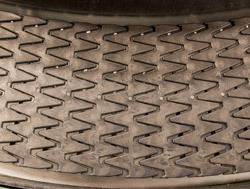 Friction inserts can be optionally added when additional grip is required. Nesting slats are used in the Mass Flow and Narrow Trak Spiral Conveyors that convey small loads including loose bottles, cans, jars and similar containers. The conveying surface is flat without gaps, facilitating a smooth and reliable product side transfer. This can be done in a single file or in mass. They are available in 6”, 9”, 10”, 16” and 20” wide slats. The proprietary low friction chain slat belt allow Ryson Spiral Conveyors to operate within a small footprint, saving valuable floor space. See the chart below for specific dimensions on our most popular models. 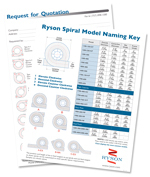 All Ryson Spirals are designed with a horizontal section at the in and outfeed. This assures a safe and reliable transition between the spiral and adjoining conveyors without product damage and undue wear. 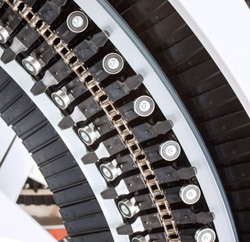 All Ryson Spiral Conveyors are equipped with an automatic chain tensioning device and built-in overload protection as a standard. in energy, controls and systems integration. 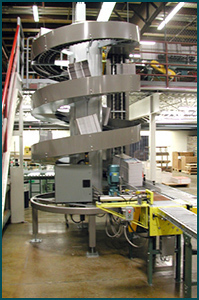 Most Spiral Conveyors are shipped in one piece, pre-assembled and pre-tested, drastically reducing time and cost of installation. Our proprietary chain slat belt assures a low noise operation, less than 75 db in most cases. 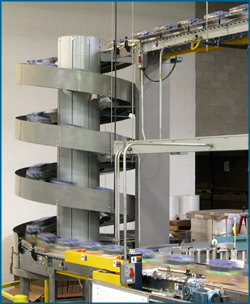 The Spiral Conveyors convey loads up or down in a continuous flow, facilitating high throughput. Many spirals can operate at speeds in excess of 200 FPM and are optionally reversible. 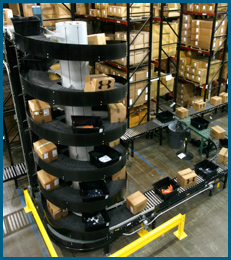 All Ryson Spiral Conveyors are made to order and comes in a wide range of sizes and configurations. Our innovative proprietary modular design allows Ryson to customize with ease and to modify in the field to accommodate emerging needs. All spirals are available in 4 basic configurations and accommodates most requirements relating to the location of the in and out feed tangents. 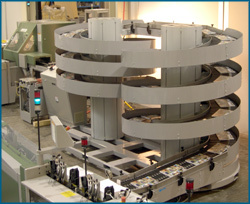 The position of the in feed tangent on up spirals and out feed tangent on down spirals can also be customized to meet specific layout requirements. 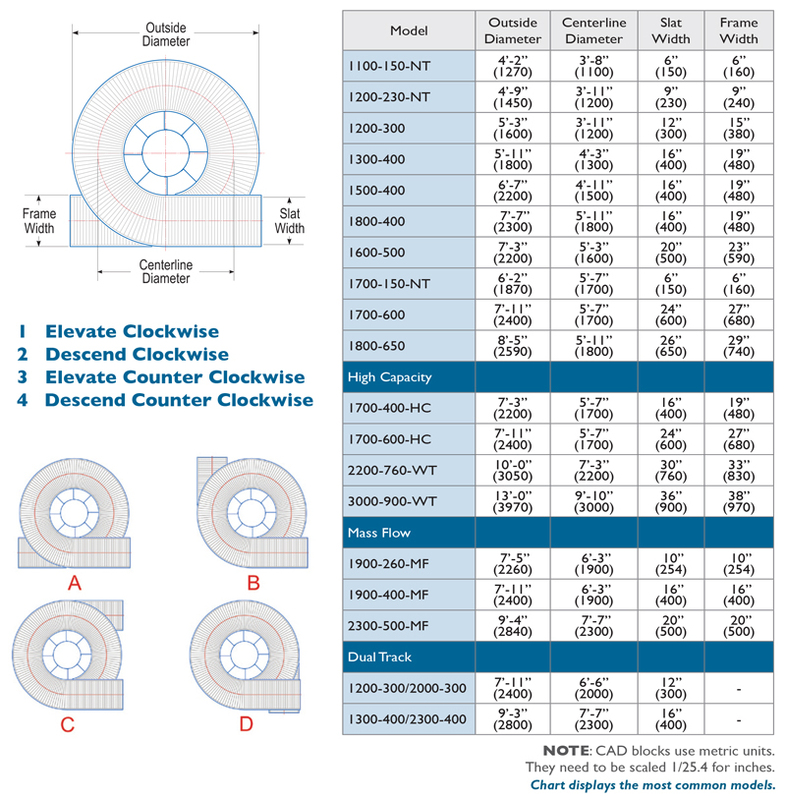 All configurations can operate up or down in a clockwise or counterclockwise rotation. Ryson Spirals are powder coated carbon steel with choice of any standard RAL color. They are also available in hybrid versions suitable for wet environments or stainless steel versions for washdown applications. . The Ryson Spirals are designed for low maintenance and long life. Only high quality components are used throughout. All bearings are sealed for life and need no further lubrication. The chain is of heavy duty nickel plated construction and needs only infrequent lubrication. The slats are made of a nylon composite, need no maintenance and can easily be replaced as single components without the use of special tools. Ryson has a full staff of factory trained service technicians ready to assist. All of our service techs are PMMI Certified Trainers. All of these factors contribute to Ryson’s low total cost of ownership. 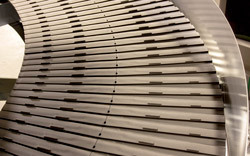 Ryson Spiral Conveyors have a very small footprint and save more space than conventional incline and decline conveyors. 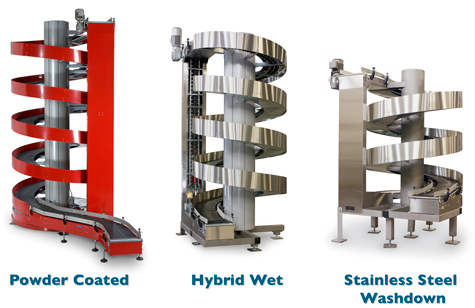 Ryson Vertical Conveying Solutions clearly utilize space more effectively as illustrated in the above comparison. 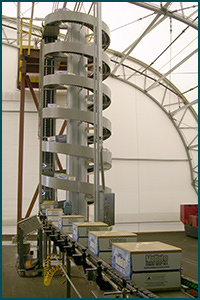 Spirals allow expansion within an existing facility or can reduce the size of a new building. 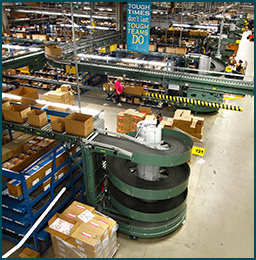 Ryson Spiral Conveyors are today being used in a rapidly growing number of small and large companies across a broad spectrum of industries. 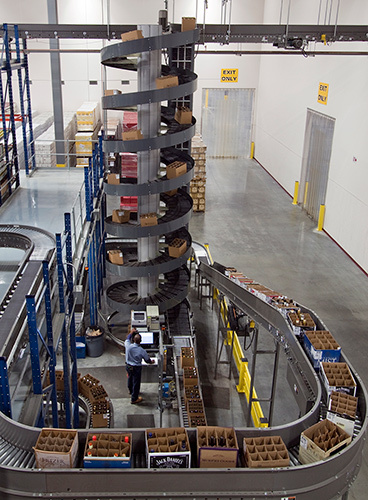 Our spirals effectively handle any conveyable loads including bags, bundles totes, trays, pales, cans, bottles, containers, wrapped and unwrapped items. 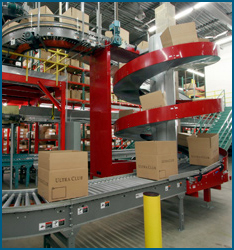 The Ryson Spiral Conveyors are frequently used as elevators or lowerators in packaging lines, many of which run 24 hours a day, 7 days a week. They are ideal in cold storage and freezer applications where floor space is at a premium. 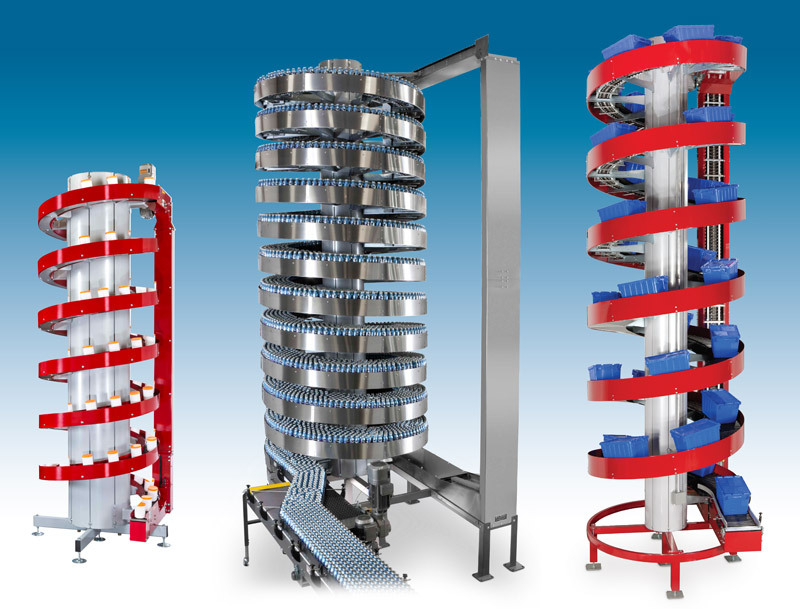 Ryson Spirals are also very attractive as continuous lifts between floors in multi level order picking systems or any other vertical conveying applications with limited space available and a need for high reliability. 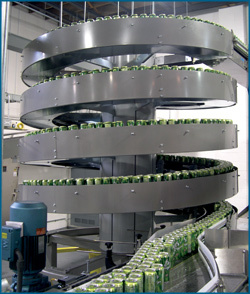 This includes mass flow of full or empty bottles, cans, jars and other similar containers. 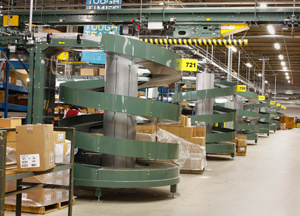 Ryson’s proprietary spiral technology has allowed us to create specialty Spiral Conveyors that satisfy many of our customer’s unique requirements. Please read further on the specific spiral that may fit your needs. 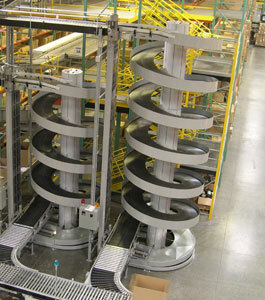 Click here to see videos of spiral conveyors in applications.